I grew up in what you might call a “flavour-free” household. I know I have mentioned before that neither of my parents were the keenest of cooks, so it will come as no surprise that the only seasonings to grace our plates growing up, were ketchup and ranch dressing. Needless to say, spices scared me. Before I learned how to cook I was afraid of eating anything out-of-the-ordinary because my sensitive taste buds couldn’t handle anything beyond the pungency of a hot dog bun. It wasn’t until I met my best friend’s mother, Annie (who I talked about in this post) that I discovered the world of flavour I had been missing out on. Funnily enough, my home nowadays smells like an ethnic food bazaar, and I am totally enamored with the power of spice. 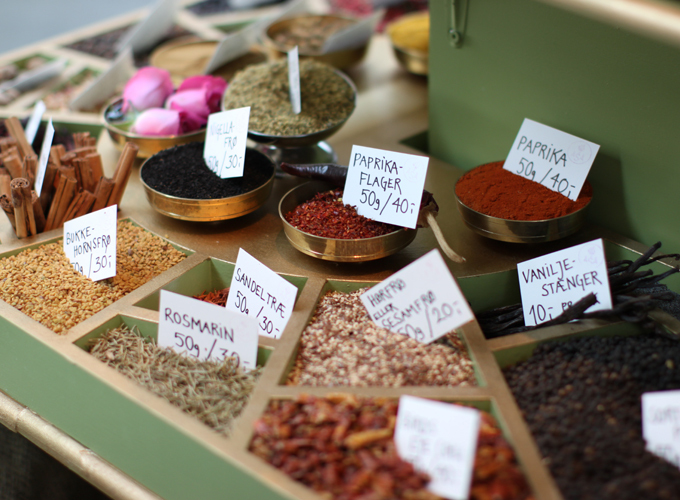 When I first began teaching Ayurvedic Indian cooking classes, I felt it was time to up my game and seek out a good source for spices. Coincidentally, this was right around the same time that a friend and fellow chef, Julian Amery, was opening his very own spice shop, called ASA, in the central market of Copenhagen. I had no idea what to expect from Julian, and whether or not buying spices from him would be any different from the ones at the local grocery store, so I was pleasantly surprised when I first cooked with his wares, that the difference was clear. Fresh spices are a whole other ball game. But why go to the trouble of buying spices from a place you trust rather just pick up some at the supermarket? For one, spices that you buy at a generic grocery store could have been sitting on the shelf for months, or even years. Let’s remember that spices are foods, so they do go bad. 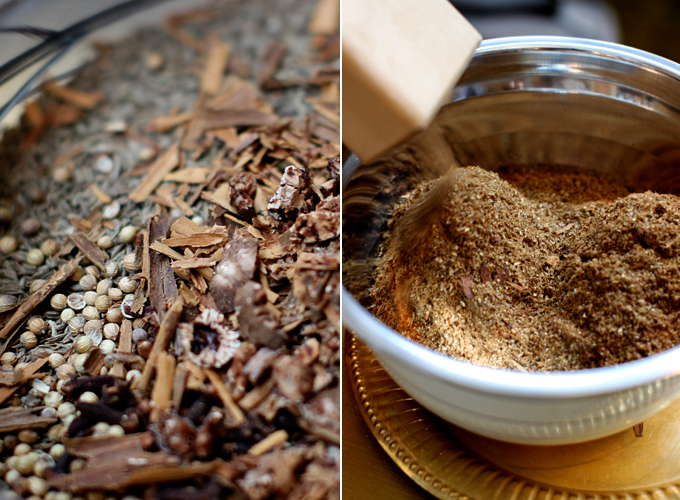 Over time spices lose not only flavour, but also their nutritional potency. Secondly, if quality and the environment matter to you, then I would also recommend buying organic, fresh, whole spices from a reputable source. They may be slightly more expensive, but you’ll actually use less. And one other thing that I hadn’t really considered before buying spices from ASA, was the politics behind the spice trade. Julian works exclusively with producer groups and co-operatives who have both a stated commitment to the social welfare of their farmers (and their families), and to their training, education and welfare. Tandoori is a traditional spice blend from India and it has many different variations according to region and household. It is typically quite hot on the spice scale, as it can include paprika, cayenne, chili, and ginger. The word tandoori actually means “pertaining to the tandoor”, which is a special, high-heat oven typically made of clay in which many different foods are cooked. You’ve probably heard of it before in relation to tandoori chicken, which is the same marinade that is used in the following recipe for tandoori cauliflower. For the Tandoori Cauliflower recipe I wanted to create my very own Tandoori spice blend, so I of course went to ASA. Making your own custom mixes, with a little help from the expert himself, is a total blast. I took my proposed spice blend list to Julian and he helped me tweak it a bit. 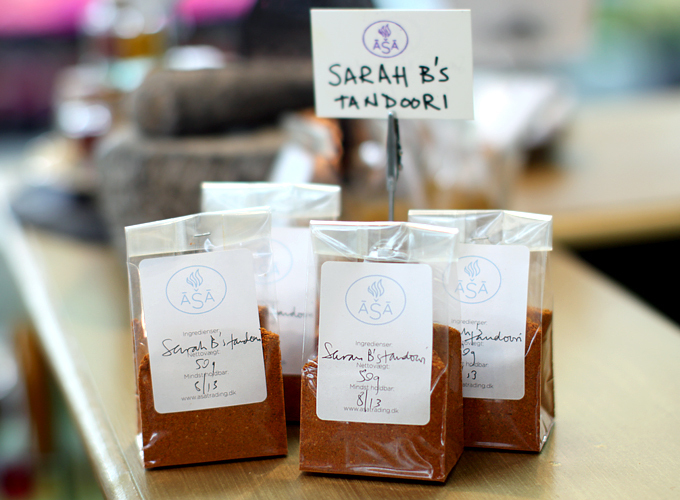 The following mix is what I settled on, and for those of you in Copenhagen, Sarah B’s Tandoori spice blend is available for a limited time in the shop! If you would like to recreate this blend at home, I’ve included the recipe below. For accuracy, it is preferable to use the weight measures. 1. Place all ingredients except for turmeric and paprika in a spice mill, mortar and pestle or coffee grinder. Grind until powdered. Add turmeric and paprika. Store in a glass jar away from light and heat. Will keep for up to six months. Julian has included what to look for specifically when you buy these particular spices and I have included the health benefits. Ground: Vibrancy and depth of golden, deep saffron colour; clean, sharp, savoury/sour acid note on the nose; fine, uniform texture; a sense of density and oiliness to the touch. Health Benefits: anti-inflammatory, helps relieve arthritis, IBD, cystic fibrosis, anti-carcinogenic, improves liver function, lowers cholesterol. Vibrancy and depth of colour – deep red; clean, deep,sweet/umami note on the nose; sweet, warm, clean flavour; fine, soft, uniform texture; a sense of density and oiliness to the touch. Health Benefits: anti-inflammatory, improves circulation, aids digestion, high in vitamin C.
This depends on the pepper. All have different characteristics. For Birds Eye Chili, which I use the most, it’s as follows- Whole, dried: Vibrancy and depth of deep red colour; sharp, acid, sweet/vinegar note on the nose (almost eye watering); at first bite – sweetness and citrus first note, then sharp, fast heat, building quickly and falling away gently over a couple of minutes. Health Benefits: Reduces inflammation, relives pain, reduce blood cholesterol, clears congestion, boosts the immune system, prevents stomach ulcers, lowers risk of Type 2 Diabetes. Whole pods: firm and plump (the older they are, the more dried out and withered they look); clear, pistachio-green casings; seeds, when extracted and tasted, should give a clean, clear taste of eucalyptus/mint/citrus, with a long finish. Health Benefits: antioxidant, aids digestion, improves circulation, stimulates appetite, good source of potassium, magnesium, calcium, iron and manganese. Look for a strong, deep, “brown” note on the nose, an oiliness to the powder (if you’re buying ground), and a deep, sharp, almost bitter taste. The more powerful the flavour, the more you will get a “cool mint” feeling after tasting and breathing in through your mouth. Health Benefits: boosts immune function, aids digestion, anti-carcinogenic. The seeds should have a golden hue. Corriander should possess an appealing, clear grassy, fresh hay and citrus note on the nose. Health Benefits: anti-inflammatory, lowers cholesterol, helps reduce amount of damaged fats in cells. When very fresh, cloves will have a deep, brown/red colour, a strong, pungent citrus note on the nose, and, surprisingly, a very strong, quick chilli-hot effect in the mouth, leaving a long-lasting anaesthetic feeling on the tongue. Little known fact – cloves can be used to add heat to a dish. Health Benefits: anti-inflammatory, anti-bacterial, high phytonutrient content including manganese, omega-3 fatty acids, vitamin K, dietary fiber, vitamin C, calcium and magnesium. There are many different varieties of Cinnamonum in the world. The most widely used are Cassia (Cinnamonum Cassia) and “Real” Cinnamon (Cinnamonum Verum). Cassia is often mistaken for and sold as Cinnamon in Europe and North America. Cassia has a deeper, redder colour, and its whole bark is thicker than Cinnamon. It has a more intense and less fragrant aroma than cinnamon. Its taste is almost medicinal, and consists of one string sweet note. I would use this more in savoury and salty dishes. The best cinnamon has a pleasant, intense, sweet, nuanced woody aroma reminiscent of summer fruit and flowers, and its flavour is complex, fragrant and warm, without the intensity of Cassia. I would use this more in sweet cooking, such as patisserie, at Christmas and for Mughal and Arab dishes. Health Benefits: anti-microbial, anti-clotting, controls blood sugar, boosts brain function, helps warm the body in the onset of cold or flu. The best whole nuts are large, firm, plump and heavy, with very little or no “give” when pressed firmly with a fingernail. Colour can vary between beige and chocolate brown. The freshest nuts will maintain their characteristic fragrance even when whole. At ASA, we import the nuts with their shell on and crack and sort them by hand. Health Benefits: anti-inflammatory, improves memory, aids digestion, improves appetite, relieves diarrhea. I asked Julian what to look for in general when buying spices. These are certainly not practices suitable for the grocery store, as tearing open all those little plastic bags could cause a stir, so all the more reason to buy at a market where you can play around a little. And what about storage? Spices should always be kept in an opaque, tightly sealed glass container in a cool, dark and dry place. If stored properly, most whole spices will last for one year, and ground spices up to six months. I first ate a whole tandoori cauliflower many years ago at an Indian restaurant back in Toronto. I clearly remember the server setting the giant platter down on our table, a big, auburn vegetable head in the center surrounded by pickled onions, herbs and chutneys. There was almost something majestic about how it was presented, and it made us all feel like royalty. If you struggle to find something really “special” to serve to your vegetarian dinner guests, I would definitely suggest this show-stopping dish. Even for those that do eat meat, there is something so impressive about tandoori cauliflower that they will want to dig in too. One of the secrets of the tandoori cauliflower is the marinade, which is based on yogurt. The yogurt helps bind the spices together, surrounds and coats the food, and the acidity naturally tenderizes whatever you are marinating. Yogurt is typically used in marinades for meat, but it works just as effectively with vegetables. If you do not eat goat or sheep yogurt, try a plant-based yogurt of your choice. The mint chutney that accompanies the cauliflower is meant to be a refreshing compliment to the intense, spicy flavours of the tandoori blend. It is bright and crisp, and delicious with many things besides this particular dish. I enjoyed some of the mint chutney on top of steamed rice and quinoa, and even tossed it around with some chickpeas. Delicious! It’s a breeze to make and can be prepared a day ahead to save time. 1. 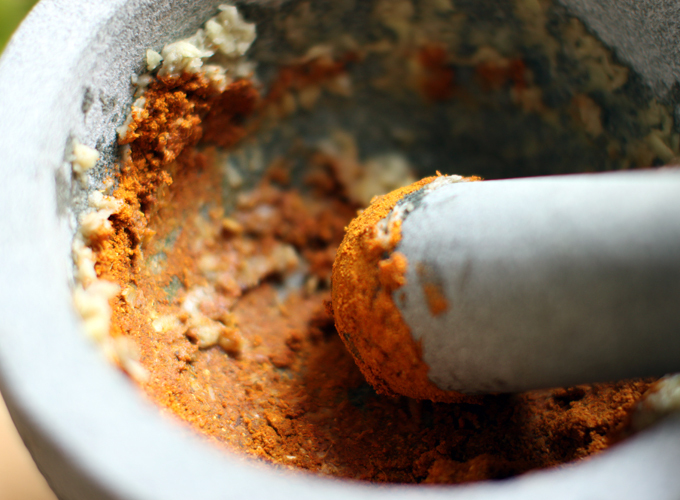 In a mortar and pestle (or food processor) smash garlic and ginger into a paste. Add the tandoori spice, lemon and salt and mix until uniform. Fold in the yogurt. 2. Place the whole of cauliflower in a large bowl and spread the marinade all over, making sure to coat the bottom as well. Place in the fridge to marinate for minimum 1 hour, maximum 12. 3. Preheat oven to 400°F/200°C. On a lined baking sheet, place cauliflower and roast until tender (45-60 minutes depending on the size of the cauliflower). Garnish with cilantro leaves, lots of lemon juice and a generous drizzle of high-quality olive oil. Serve immediately with mint chutney. Enjoy. 1. Place all ingredients in a food processor and pulse until a chunky pesto-type of sauce results. Season to taste. Enjoy with all tandoori dishes, on top of rice or legumes, or as a spread on crackers or bread. Store leftovers in the fridge. Keeps for 5 days. I hope this post inspires the spice lover in you to run to the nearest ethnic food shop or market to play and explore. I cannot tell you how much fun it is just spending just five minutes browsing for spices, and then taking them home to experiment with. If this seems daunting, start with just one or two spices, see how you like them and build your pantry from there. Whatever you do, don’t let your household be a flavour-free one! I have a tandoor, I think I should try to make this tasty yummy dish. A lot of Indian going on here! It took me a while to properly appreciate fresh spices and to get into grinding them at home, but now I’m a total convert. The tipping point might have been when I admitted to some co-workers in Mumbai that I didn’t grind spices at home. Oh, the shame. This recipe is too good and I cannot wait to try it. The only problem is that I don’t have a microwave in my hostel and none of my friend has it. Can i make it in a frying pan ? Never more have I wanted to be back in Copenhagen! I passed this spice shop in Torvehallern all the time and never ended up checking it out. Do you have any suggestions for where to get spices like this in Toronto? I love walking into a good spice shop! And I just picked up a head of cauliflower this afternoon, now I know exactly what to do with it, thanks! Genius! What a great idea — the cauliflower looks event better than the standard chicken. It kind of reminds me of eating a giant stuffed portobello. 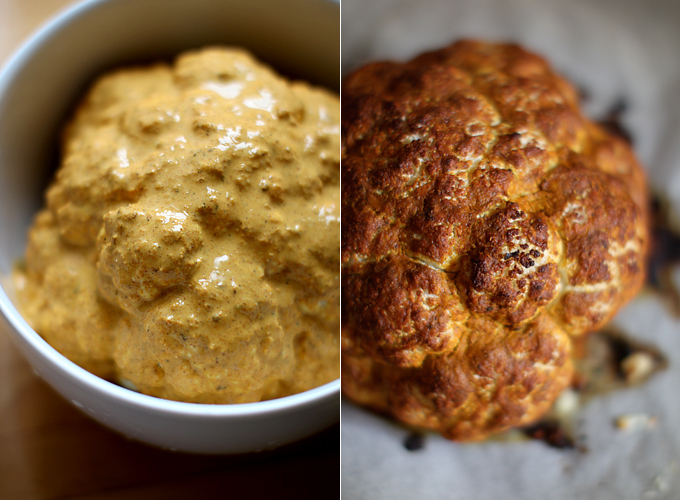 Cauliflower sure doesn’t get enough playtime – will definitely be bookmarking this! Try House of Spice in Kensington Market- it isn’t fancy like this store … or, Spice Trader on Queen West (at Bathurst?). If you are looking just for your basic Indian spices, go to any Indian grocer in Toronto, Mississauga or of course Brampton. You would be surprised what you can find even at your local NoFrills. Any recommendations on vegan substitutes for the yogurt in the Tandoori sauce? This looks wonderful! It reminds me of sitting down to a giant blooming onion, only WAY better!! What a show-stopper! I grew up in Indonesia eating heavily spiced South and Southeast Asian food, but am only just learning about the health benefits now — your spice encyclopedia is marvelous, and I think you should keep adding to it! I also live in Cph and know that shop ? but i got all the ingredients for tandoori at home and I just made it ? now going to cycle to the nearest Middle Eastern butik and hopefully find some yoghurt there! I’m definitely going to make the tandoori spice blend (and bring it to Venice where I’ll be the next few months, shhh: don’t tell any of the Venetians that I’m bring food with me to Italy, gasp). I think that it would also make quite a hot gift. Sarah, I stumbled upon your blog just recently and it is one of my new favorite sites to explore! What a clever way to prepare cauliflower; it makes for such a striking presentation. Do you know how much he charges for a bag of the spice blend? I love your blog and Julian’s shop in Torvehallerne! Thank you for this delectable recipe and spice guide. Can’t wait to try this ? I made your recipe lots of times. It is still delicious! I guess someone was inspired by your recipe in Holland…… I used soy yogurt, which was fine, and arranged the spices mix with what I had in my kitchen : everything except nutmeg and cloves. Looks really good when you slice it like a cake. And I enjoyed it cold in my lunchbox the day after. Pictures are on my blog! Made recipe this evening, and I’m sorry to report that it looks better than it tastes. H in oven 400F was not enough time to cook it through. The outer edges were delicious, but the inside was moist and soft. If I made this again I roast only the florets or cauliflower get smaller. This recipe is too good and I cannot wait to try it. The only problem is that I don’t have a microwave in my hostel and none of my friend has it. Can i make it in a frying pan ? Cut the cauliflower into little pieces, marinate it and cook it in a pan with lid on ?? I made this today and it was amazing- thank you for the beautiful recipe ??? Cut the cauliflower into little pieces, marinate it and cook it in a pan with lid on ?? Love this recipe! I tried last week and me my boyfriend both found it delicious! I used soy yogurt, which was fine, and arranged the spices mix with what I had in my kitchen : everything except nutmeg and cloves. Looks really good when you slice it like a cake. And I enjoyed it cold in my lunchbox the day after. Pictures are on my blog! I never thought this would taste this yummy !! I just have to say that I’ve made many many MANY times and it’s always amazing. Thank you for this show stopping, delicious, unique recipe!!! Superb! A huge hit. I replaced the yogurt with soy cream and for the sauce I used coconut cream. Was really delicious, thank you! Thanks for the beautiful recipe Sarah. This is my first of yours that I’ve tried, and I intend to make many more. The flavors, textures and colours were lovely. Thank you for including a vegan alternative as well! Ah, I’m so nervous! I just marinated the cauliflower & will be serving it tomorrow to a guest…I used a jarred/pre-made spice mix because that’s all I could find today, but I hope it’s still tasty…! Would do this on the grill with apple chips…how long? Sounds fab! Thank you Sarah for this great recipe! Thanks again, I love your blog, always so informative and mouth-watering. Take care! I just made this tandoori cauliflower, mint chutney and pickled onions and it was all bursting with new flavors and absolutely delicious!!! Thank you for sharing these wonderful recipes. I look forward to making this regularly. Never has cauliflower been so scrumptious. Pingback: Cauliflower and Chickpea Salad with Tahini Yogurt | every moment's a little bit later. Update on my original post (where’d it go? ), where I was underwhelmed by the results. We took the leftovers, cut them into florets, drizzled them with olive oil, and roasted some more. This time – awesome! While the presentation was not as impressive as roasting it whole, I think I’d make it the latter way again in the future. I made it today. It needed much longer time in the over and even I left it there 30 minutes longer the middle was still a little bit hard. Probably needs to be lightly boiled first (before marinating of course) or roasted in smaller pieces. Apart from being a little hard, the taste was great. It also looked beautiful. This is delicious. Mine didn’t look quite as good, but it tasted it. I didn’t have the ingredients for the mint chutney, but I had some banana chutney. I’d like to try the mint chutney next time. This is brilliant. About a week before you posted this I was also thinking of whole roasting a vegetable – but I had an aubergine in mind. I made this cauliflower today (my boyfriend asked if it was a white broccoli(! ), but tweaked the recipe a tiny bit. I added half a gram of saffron 😀 Happy autumn days Sarah! This is one of the most original recipes I’ve seen in a long time. We’re going to make it this weekend. Wonderful photos too! Made this for dinner tonight; so, so good. Thanks for the recipe. The mint chutney was refreshing and delicious and I got to use my mint one more time before it freezes Friday night! My husband and I tried your recipe this weekend. He loves cauliflower, while I tolerate it. We marinated overnight and it came out very nicely. I think next time we’ll marinate longer and cut it into slices. 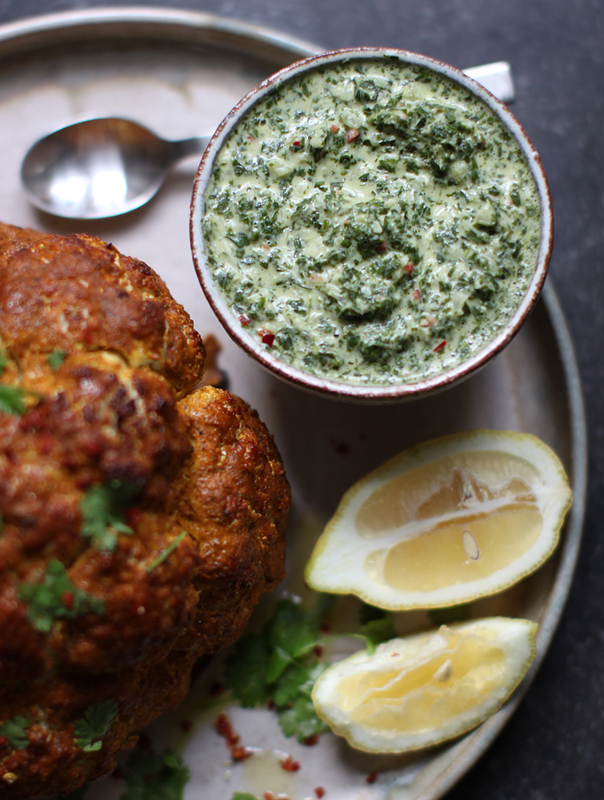 I think tandoori cauliflower would would make an awesome burger or wrap. Thanks for a lovely preparation. Very nice recipe.The content in the blog is very informative and effective blog.I will bookmark your blog for regular visit.Keep good work in the blog. Discovered you via The Kitchn – this is seriously gorgeous! I was just introduced to your blog by a friend. Not only do you look like a friend, but I would love to enjoy every single recipe you have! Bravo!!!! I used to be confused and uncertain about herbs. But I discovered the following trick, if you want to know what a certain herb will do with your food, take a small bowl of hot/ nearly boiling water, throw a bit of the herb in and smell it. I will definitely try making this cauliflower (also sounds like a great dish when you have to work, you marinate the cauliflower in the morning and put it in the oven when you get home). I made this recipe and it’s absolutly fantastic, thanks! This looks amazing. Indian food is my absolute, without-a-doubt, fav. Photos are so lovely too. Thank you for the inspiration! I like so much your recipes, and the photography’s are fantastic. I’m following your blog now. Just a quick note to say that, due to pressure of demand, we sold out of your mix in the shop very quickly. I’m happy to say I’ve just mixed and ground another couple of kilos, and it’s back in stock. Julian at ASA. It looked so great that I needed to make it as soon as I could. I got it spicy because of my chili was very hot but chutney compensated the spiciness i a best way. It was very delicious and warming up! I made this on Saturday night. Looked exactly like this! Happily I had all the spices (I know, I couldn’t believe it either). The chutney is a must, and I must say it tasted better the next day. This was so fun to make and eat! 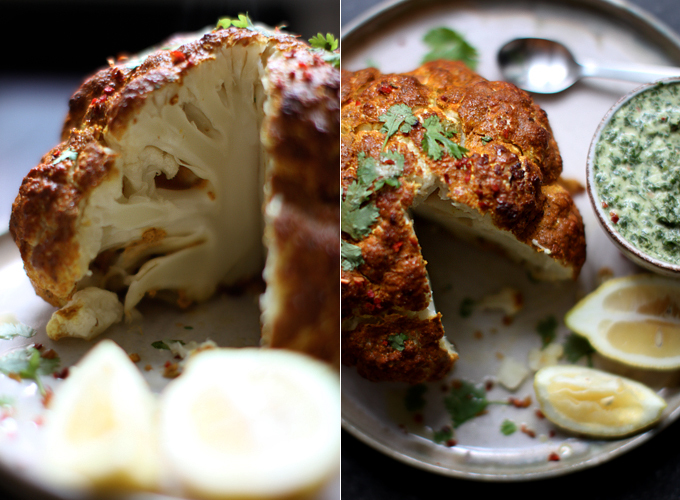 A whole roasted cauliflower! Love it. I’ve always loved spicy food so I’ll have to give this a try. Terrific resources in this post, as always. Love the explanation and info on spices. I’m usually shocked at people’s notion about the spicy factor of using spices as such. In my opinion, spices when used correctly not only enhances palate flavors — it also contains many health benefits. Love you blog and love the spice store ASA reminds me of a movie I saw ” mistress of spice” which had a similar spice store in the movie…..I would love o visit ASA one day…..will be such a treat to smell the aromatic spices…..!! Defiantly on my list of things to do !! I am in love with cauliflowers so you are perfect for sharing this. Also, that spice shop looks so divine! I love spices but I can never use them fast enough. The cauliflower looks so delicious! Must try this! so I made it and ate it, both with a lot of pleasure! I like my cauliflower crunchy, my boyfriend not that much, so next time maybe I’ll steam it little first. but what absolutely stole my heart is the mint chutney, or perhabs mint raita, which was totally fabulous, really loved it! thanks for sharing. I’m going to Copenhagen (I live in Oslo) in November, and I’m definitly going to visit this guy. I use way more cumin and cinnamon than I’m happy to confess, and I can’t wait to try something different than the ordinary spices from my local supermarket. Sorry to say, but this one looked much better than it tasted. I’ve got a chronically inflamed gut and the great thing about creating my own spice blends is I can leave out the hot pepper or anything else that irritates me. I’ve been using Madhur Jaffrey’s recipe for curry powder. I welcome this new recipe for spicing up my kitchen while still compensating for my delicate digestion! what a unique recipe! i just love roasted cauliflower! love that spice mix! Made the recipe this evening and I’m sorry to report that it looked better than it tastes. An hour in a 400F oven wasn’t enough time to cook it through. The outside edges were tasty but the inside was raw and bland. If I made it again I would roast only the florets, or get a smaller cauliflower. Sarah, this looks absolutely delicious. And the photos are stunning. My mouth is literally watering! You have convinced me to pick up some fresh spices from our local spice market. And dare I try to make my own tandoori spice blend? Why not! Thanks for the inspiration. This sounds amazing and looks so elegant. What other flavor combinations do you think would be good? Perhaps something with nutritional yeast – cheezy and roasted sounds yummy! Hello dear friends! WOW. I cannot believe how pumped you are about this one – awesome!!! Laura: I added in the post that you can use a plant-based yogurt or coconut cream. I bet the latter would be absolutely delicious! Julia – you roast either the florets alone or break up the whole head after roasting…it’s up to you! The whole head will take longer to cook, of course. gill-mac – I like to buy many of my spices in Kensington market. There are a couple wonderful places along Augusta – not sure about the names! You definitely upped your game. I love that you showcase vegetables. Many blogs seem so afraid to do anything other than lots of baking and meat laden, processed carb dishes. Yours is definitely the blog I aspire to be! I also live in Cph and know that shop 🙂 but i got all the ingredients for tandoori at home and I just made it 🙂 now going to cycle to the nearest Middle Eastern butik and hopefully find some yoghurt there! thanks for the inspiration, the cauliflower looks simply beautiful! fantastic review of the spices. Really informative, thank you. I agree, the quality of your spices makes a huge difference. We are in India a few months a year and always stock up on organic spices we can find at a place there which are quite different from anything I’ve found back home in London. Can’t wait to try this, it looks amazing! amazing and I’ll bet it’s delicious to boot, clearly, otherwise it wouldn’t have been shared! That looks amazing! I would love to see photos of your spice storage — all of mine have always been in clear containers and it looks like they keep them that way at most shops too. Wow, amazing. I have used tandoori paste on most foods – but never cauliflower. I will be reproducing your idea on the weekend. One tip – if you find chilli powder too spicy, you can replace with Kashmiri Chilli Powder, which gives the same taste without the BANG. Thanks Sarah, love it! What a beautiful post, and such an fabulous idea – I can’t wait to make one. Thank you Sarah for sharing, always inspirational! I love tandoori with a passion and I love cauliflower with a passion. Needless to say, this recipe is perfect. Oh my goodness! This is so cool!!! You are a genius with that whole cauliflower. Love your personal spice blend on display. What an amazing place to buy your spices. Thanks for taking us on a tour. You’re truly genious! I was shopping at my Demeter Farmhouse today and I looked at the cauliflower, hesitating to buy it. But none good recipe came in my mind, so I left it out. But your recipe looks so mouth watering, I will go back tomorrow and buy a big, nice cauliflower. This is so catching! I can’t wait to have guests over so I can serve this beautiful dish! Thank you for such inspiration. First of all, that spice shop looks amazing! I wish I could saunter by and pick up some of your tandoori blend myself. I love all things cauliflower and can’t wait to add the mint chutney. Thanks for sharing – I really enjoy your blog! This looks amazing! I need to try this immediately! This has to be one of the most gorgeous looking iterations of cauliflower I’ve seen in a long, long time. 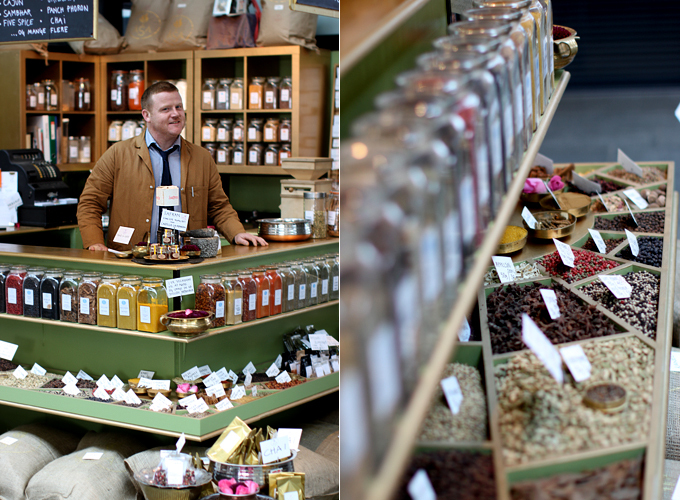 I can get lost in spice shops, and frankly, overwhelmed. I want it all! You have GOT to be kidding me. Oh I can’t even take how gorgeous this is. This seriously looks good. Like really, really good. Thanks for another inspiring recipe! This looks so yummy!!! Is there a vegan substitute for the yogurt? Maybe some kind of oil, or something like that? To Laura Wilson, regarding a vegan yogurt substitute, I have used coconut yogurt or even a smaller quantity of coconut milk in tandoori marinades with great success, although the consistency is usually a bit thinner. I love the idea of serving the whole head! I can almost smell the spices 🙂 Thanks for sharing! This is so beautiful! Thank you for sharing! Your recipes are so creative and in inspiring. Thank you for taking time to blog and for sharing your passion with us readers. What a wonderfully informative post, thank you! I also grew up in a spice-phobic household, so I’m just starting to get my bearings. This is a genius idea – I want to dig a fork in right now!